Here I am. Almost done my first week of classes in my library program. I’m starting to get settled in with all the changes that are occurring but I know there is still work to do before I am completely comfortable with everything (if I ever get that far). The transit system has probably been the hardest to adjust to. Tuesday, on the way back from school I went to the wrong bus stop and eventually figured out I should go to one just around the corner to catch my bus. Then, I got off at the wrong stop. I had been repeating the stop in my head and when I heard part of it, I guess I kind of panicked and pulled the stop cord thingy. So, I got off and when I looked around I realized I was not at the right place. I didn’t entirely know which way to walk so I headed one direction. I had already walked a fair distance when I saw a Tim Horton’s which was where I turned to go to my aunt’s place so I realized I was going in the wrong direction. I then headed back the way I came which was the way I should have been heading all along. I walked for at least 20 minutes, probably more, by the time I arrived back at my aunt’s house. I walked a little over 2 kilometers which is about a mile. It was above 30 degrees Celsius and I was carrying my laptop bag so I was absolutely tired by the time I got back. By now, I’m starting to recognize stops and when it’s getting close to when I have to get off. As long as I know which bus to take and when to get off, I’m fairly good with it so far. I even created a note on my phone for when the specific bus I normally take will be at each stop. It’s handy to know when the bus will be arriving at a stop I need to get on at. This week, I’ve done a lot of comparing, as well. I’ve compared the city transit system with the bus system in Mexico. I’ve compared this college with my old college. I’ve even seen people who look very similar to people I know from elsewhere and had to take a second look to make sure it wasn’t actually them. I’ve also compared how different I am from when I just ended high school. I’m not as afraid to be by myself and I’ve talked a lot more readily than I would have even in high school. A few years ago, I never would have been able to do this; taking the bus to downtown Winnipeg and sitting in class with a bunch of strangers. My anxiety is a lot better than it used to be and that is a good sign. I’m lucky this week and don’t have classes this Friday because one of my professors had a family emergency or something and is cutting back on classes this week. It’s nice because I can go home tonight and relax before going away for the weekend. It will also be nice to sleep in past 7:30 and sleep in my own bed. And hopefully sleep through the night instead of waking up every so often. Right now, I’m sitting in a classroom waiting for my class to start. Today is the official first day of classes while yesterday we had an orientation. I think I’ll enjoy the program but I know that my anxiety will but a shadow on the classes itself. I’ve wondered what exactly is causing my anxiety so I can better combat it. I think the part that gets me anxious the most is the busing to get to school because there is so much to know and look out for. I need to be aware of which bus I need to take, what time it will be arriving at the bus stop so I can be early, when I need to get off, where I’m going once I get off the bus, etc. It can all be a bit overwhelming for me. Because of it, I haven’t been able to eat much the past couple of days and I’ve actually gone to bed really early. All the changes and new things I need to get used to, all produce anxiety to some degree. I have to get used to living in a new place, sleeping in a new bed, the noise levels, the unavailability of wireless internet connections, the food, busing, new people, new schedules, a new building and having to find my way around. I seem to be fine once I get in the classroom with the people in my program, though. So I’ll have to see how it goes. There have been times when I want to quit but I’m not a quitter. I’ll at least stick out the week and see how it is after that. I know it may take a while before my anxiety is under control for this year because when I first went to SBC, the school before this one, it took at least a week and I seem to think it may have taken a couple of weeks. I’ve been so tired these past two days, it’s been ridiculous. On Sunday, when I arrived at my aunt’s (who I’m staying with for the school year), I went to bed at around 10:30 which is early for me. Yesterday, I took a nap after I returned from orientation and I rarely take naps. I’ve probably doubled my naps this year. Then, in the evening, I felt really tired again and was in bed before 9:30. When at SBC, I would never go to bed before 11:00 so this is very uncharacteristic of me. It might have something to do with waking up every couple of hours in the night and waking up early. Yesterday, I got up out of bed at 6:30am so it kind of makes sense why I’d need a nap in the afternoon. Anyways, enough of boring you with the changes in my life and my sleeping patterns. Hope all of you enjoy your days. The monster that tries to eat me alive is threatening to overtake me again. It is that dreaded thing called insecurities. I have too many of them. I know I do. But the insecurity monster doesn’t want to leave me alone. I was doing well at ignoring the monster but in the last while it has started to rear its ugly head again. Only this time, the monster is focused on my writing. In the past few weeks, I have promoted my book more and more and more people are buying it and reading it. I also did a book giveaway on goodreads.com and gave away three copies of my book. I had my rural municipality put up an article about my book and I on their webpage and a local newspaper contacted me to do a feature on my book as well. I’ve corresponded with someone who may critique my newest book. I also re-read my book, Love Unrealized because it had come to my attention that there were a few typos in it. 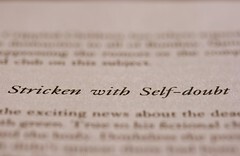 I probably shouldn’t have re-read it. Fixing the few typos was a good thing but reading my book again fed my insecurity monster. I was becoming very critical of my book as I was reading it and finding everything that was wrong with it. I started doubting whether my book was good and whether people would even want to read it. With all the attention I’ve got about my book and having more and more people read it, the more and more my insecurity monster grows. It asks me why anyone would want to read something I’ve written. What makes me think I could write something in such a way that people would actually pay for it and spend their time reading it? What if they don’t like it? What if they do? Would people even tell me if they don’t like it? Am I fooling myself that I can even write well? My insecurity monster is the main reason I haven’t tried getting my book published by a real publisher. I doubt they would like my ideas. I doubt they would want to publish anything I write. I doubt I could even write well enough they would even consider publishing my books. I doubt if I could do the marketing thing. I doubt I could meet their deadlines. I just doubt a lot of things when it comes to me and my abilities. I sometimes wonder if I doubt myself so much because of my provincial ELA exam in grade 12. For the writing piece at the end of the exam, I wrote a story. I thought it had been okay. It wasn’t my best piece but I didn’t think it was that bad. When I got my marks back from the exam, it was my story that had brought my mark down. The worst part was I had received a 2 out of 5 on my ideas. I was crushed. My ideas had failed. I became depressed because of that exam and sometimes wonder if I did so bad on my story, why I even bother writing anymore. If my ideas fail, why do I even try? I am an overachiever filled with self-doubts. Right now, those self-doubts are feeding my insecurity monster and he is growing. I hope one day my insecurity monster will leave me alone for good but now it is filling me with doubts about my writing. In my last post, I talked about my last couple of weeks and how many things I’ve had going on. These past few weeks have also been a little crazy as far as my writing goes. I have been getting a lot of attention (at least from my standpoint) about my book and the fact I wrote a book. Someone I know had come into the library about a month ago and talked about the book I wrote. Prior to this, I hadn’t told the people I work with about my book. Since the head librarian found out about my book, I finally got the courage to “donate” my book to the local library. The library bought a second copy of my book this past week to set up a “display”. This past week, the reeve (similar to a mayor) of our Rural Municipality (similar to a county in the States) came to the library and my boss mentioned to him about me writing a book. He was very excited about it and talked about it to one of his staff. Later in the week, he came in again and took some photos of me with my book. The next day, the staff he talked to about the book, phoned me at work and I participated in my first interview. That was yesterday. Today, they posted the article. Read the Article Here. It feels a little weird to be getting so much attention. I’m not sure if I like it yet but I know I might get used to it. I’ve never been one to like being in the spotlight so when I don’t know what to do with the attention. Maybe I’ll get used to it, although I don’t think I will ever get completely used to it. I haven’t written in a while or at least it feels like a while since I was writing three times a week until a couple of weeks ago. I thought I’d give you a little insight into what is currently going on in my life and will be happening in the near future (as in the next couple of weeks). These past couple of weeks, I have been working on my wip (work-in-progress a.k.a. my new book). I had been procrastinating all summer working on it and was never seemingly motivated to write even though I wanted to. I made excuses until one day, I finally decided to make word count goals and came up with punishments and rewards if I made or didn’t make my goals. I also made a chart to keep track of my word counts. Since making those goals, I have been writing everyday and have only had to punish myself once. I hope to get my first draft of my wip by Christmas. In about a week and a half, I will be going back to college to start a 2 year program so I have been getting ready for that. Today, before work, I went to the campus where I will be studying to get my student photo id card, pay my first semester fees, as well as buy my textbooks for the first semester. There are some things I will have to get used to going to this college as opposed to the Bible College I went to before. I will be taking city transit which I have never done before and have been trying to figure out routes and timetables. I will be staying with my aunt throughout the school year so I will have to get used to living in a new place again and get used to different routines. I am excited but also nervous about this new adventure in my life. Another thing that I have been busy with is work. I have been working 35 hour weeks spread out over six days with my workday never starting before 11 am but there are times when it also ends at 8 pm so it kind of splits up my days. I have been running a Summer Reading Program at the library where I’m working which is wrapping up. Next Tuesday, I will be having a wind-up party for those who participated in the program so I have been busy planning and getting everything ready for that. 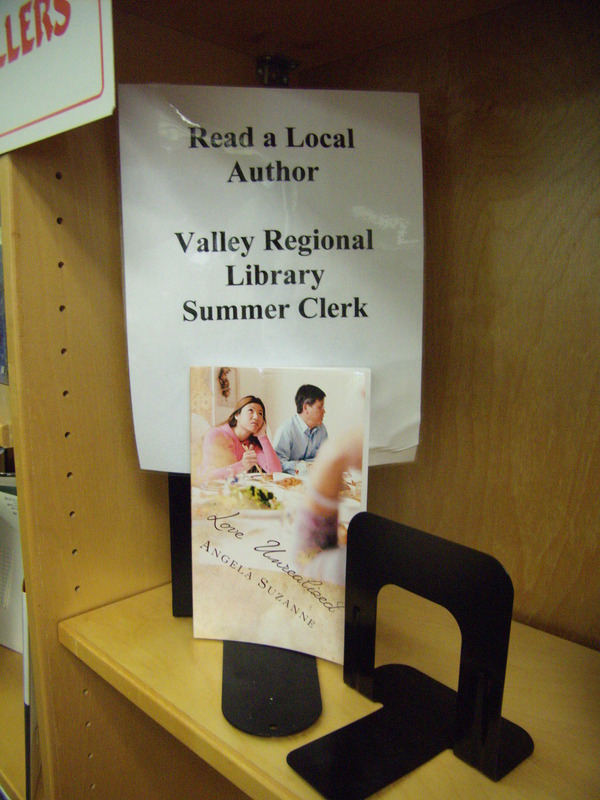 About two weeks ago, I “donated” my book Love Unrealized to the public library where I work. Although they insisted on paying so I let them. I also donated my book to my church’s library but I didn’t tell them I had written it. I still feel kind of weird letting other people read my books but I’ll get used to it. Someone has already even taken out my book, read it and brought it back. I don’t think they knew I wrote it as I go by Angela Suzanne when writing when Suzanne is actually my middle name and I didn’t ask them what they thought because I was scared of what they might say but, once again, I’ll get used to it and become more bold. Yesterday, the woman who writes my cheques, told me the Library Board had decided to buy another copy of my book so they could set up a display. For Labour Day weekend, my family and I are going away for the weekend but I haven’t been thinking about it much even though it is only a little over two weeks away. I’ve had other things on my mind and by that time I will have had a week of college under my belt. However, I hope to get a lot of writing done then but it all depends on what all my family decides to do on that trip. So that is a brief summary of the past few weeks as well as what is coming up for me. Hope you all have a fabulous week! I don’t know when I’ll post again as my blogging schedule has been messed up since daily working on my wip. I am in need of a critique partner, or at least someone who is willing to critique my work. What I was thinking was to send (preferably via email) a few chapters at a time to someone who would critique my work and send their feedback back to me so I could better improve my writing as well as the book I’m currently working on. Feedback could be in the way of things I need to change or improve on, where I need to add more detail or even remove detail, or even ideas you think might work in the story. I’m wanting almost any feedback you can give me. I am willing to critique another’s person work if they want me to do this. At this point, I’m not sure yet if I’m willing to pay for the critique but I am willing to listen to ideas you have on being paid as to how much and with what. If you are willing to critique my work, please contact me whether on here directly or by emailing me.